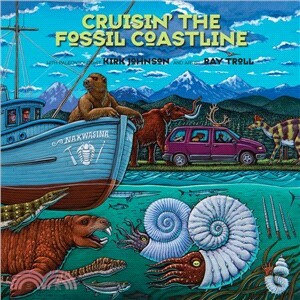 In the much-awaited sequel to the bestselling book, "Cruisin' The Fossil Freeway", we are back on another road trip with paleontologist Kirk Johnson and artist Ray Troll. This time the two friends drive, fly, and boat their way from Baja California to northern Alaska in search of the fossil secrets of North America’s Pacific coast. They hunt for fossils, visit museums, meet scientists and paleonerds and sleuth out untold stories of extinct worlds. As one of the oldest coasts on Earth, the West Coast is a rich ground for fossil discovery. Its wonders include extinct marine mammals, pygmy mammoths, oyster bears, immense ammonites, shark-bitten camels, polar dinosaurs, Alaskan palms, California walruses and a lava-baked rhinoceros. Join in for a fossil journey through deep time and discover how the West Coast came to be the place it is today. Kirk R. Johnson is a paleobotanist and the Sant Director of the Smithsonian's National Museum of Natural History in Washington, D.C. He is the host of two recent PBS series, Making North America?and The Great Yellowstone Thaw. ?He has written ten books including Prehistoric Journey,?Cruisin' The Fossil Freeway,?and Ancient Wyoming. ?Ray Troll is an artist who has illustrated ten books, including Cruisin' the Fossil Freeway,?Sharkabet, Rapture of the Deep,?and Planet Ocean. ?He and his wife, Michelle, own and operate the Soho Coho Gallery in?Ketchikan, Alaska.